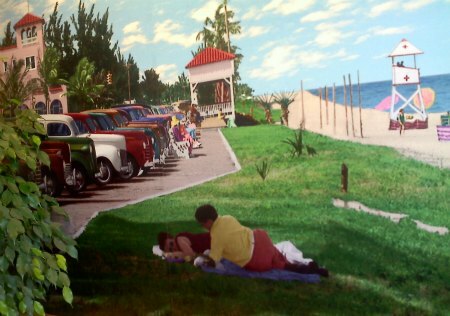 The Delray Beach historical beach walk begins at the north end of Ocean Boulevard (A1A), near the intersection of George Bush Blvd and A1A. 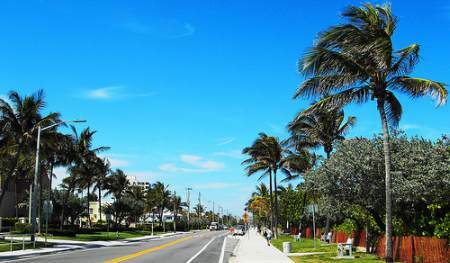 The walk takes you south on A1A, approximately one mile, ending near Causarina Blvd. If you'd like to make it a shorter walk (1/2 mile), you can easily do this by simply starting or stopping at the halfway point. 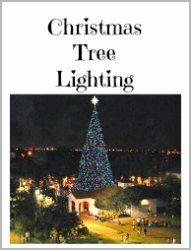 Photo Credit: Photographically Yours, Inc.
along historical A1A (Ocean Blvd.). The US Mail route was established in 1885, prior to I-95 and the railway, so mail delivery was, um...well...more difficult! 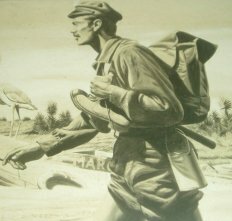 Since fresh water was unavailable for horses, there was no Pony Express in Florida -- instead it was the Barefoot Mailman! The only way for mail delivery was by row boat as far as the Lake Worth Lagoon and walking south from there. He stopped at the Orange Grove House of Refuge in Delray Beach before continuing his route to Miami. The Orange Grove House of Refuge was constructed in 1876 and sadly burned down in a fire in 1927. One mailman, Ed Hamilton, mysteriously disappeared while making this six day trek. Speculations abound about what may have happened to him as he walked through the Hillsborough River area known to be heavily populated with alligators. His mail pouch and some of his clothes were found at the edge of the inlet by Charles Pierce another pioneer. 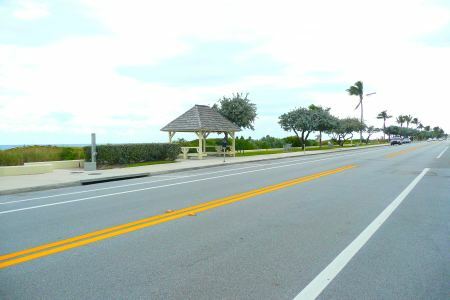 You'll find a sidewalk and a walking path that run parallel with the beach on the east side of A1A (Ocean Boulevard). You'll want to stay on the sidewalk so you can easily view the historical markers -- as they are facing the sidewalk. This beach walk is filled with historical markers, landmarks and nice sitting benches along the way. You'll likely have a very nice breeze from the ocean. This is pet-friendly too! So, please feel free to bring the pups! They are allowed on the sidewalk. 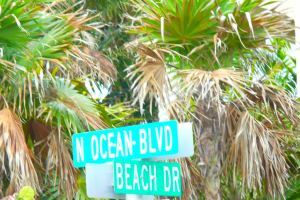 This beach walk begins south of George Bush Boulevard, just near the intersection of N. Ocean Blvd and Beach Drive. The walk continues south, approximately one mile, ending near Casuarina Road. Looking west at 120 N. Ocean Blvd, The Grosvenor House condominium is seen. This was once the site of the Orange Grove House of Refuge that had been built in 1876 by the US Life Saving Services. It was the first known building in Delray Beach and was used by the Barefoot Mailman on his overnight rests before continuing to deliver the mail up and down South Florida's beaches. 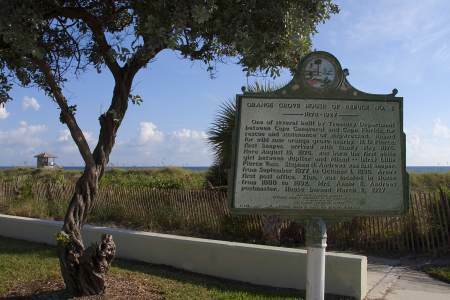 East of the sidewalk, continue your historical beach walk beachside, and pass the Orange Grove House of Refuge Marker. Built upon the site of the 1923 Seacrest Hotel which was demolished in the early 1980’s, the Marriott Hotel now stands gracefully on the corner of Ocean Boulevard (A1A) and Atlantic Avenue. Located east of the sidewalk, on N. Ocean Blvd. is the Bicentennial Marker erected for July 4, 1976. On the southwest corner of Atlantic Avenue and 2 South Ocean Boulevard, is the Visitors Information Center and Sara Gleason Park. This is the former site of the Old City Casino and salt water pool, built during the Great Depression of the 1930’s. If you'd like to take it easy and turn your beach walk into two half-mile walks, the pavilion is a good halfway point. This is at the intersection of Atlantic Avenue and A1A (Ocean Blvd.). 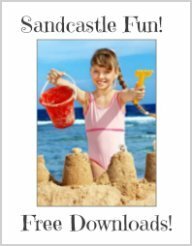 Go ahead and stick your feet in the sand and have some fun on the beach or maybe you'd like to enjoy the magnificent ocean view from the balcony of Boston's 50 Ocean restaurant or check out their very fun tiki bar called the Sand Bar! 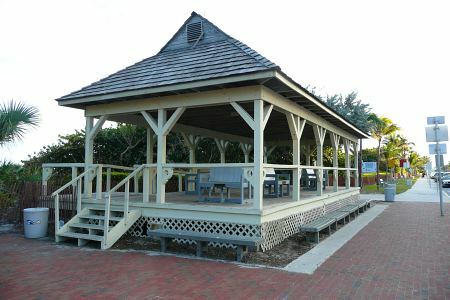 On the east side of A1A, directly across from the Visitors Information Center, is the Delray Beach Pavilion which served as the center for many activities of the pioneer families beginning early in the 20th century. The present pavilion is an architectural homage to the Orange Grove House. Here's a photo of the same intersection at A1A & Atlantic Avenue back in the day, circa 1940. You can see the pavilion in the background in the photo below. Located on the west side at 50 South Ocean Blvd on the site of the Old Casa Las Olas Hotel is Boston’s on the Beach Restaurant. 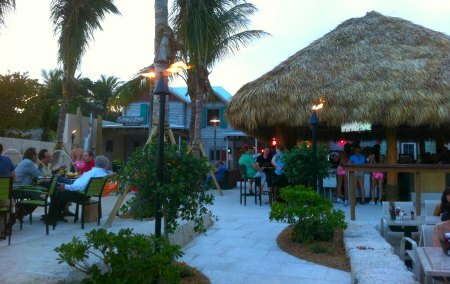 The new tiki bar (Sandbar) now sits where the historic Bermuda Inn use to. This is actually three establishments in one! You'll find the Sandbar (which is an amazing tiki bar), and then there's two restaurants -- one casual dining (Boston's on the Beach) and the other, a fine dining restaurant, called 50 Ocean. 50 Ocean is upstairs and is one the best oceanview dining in Delray! 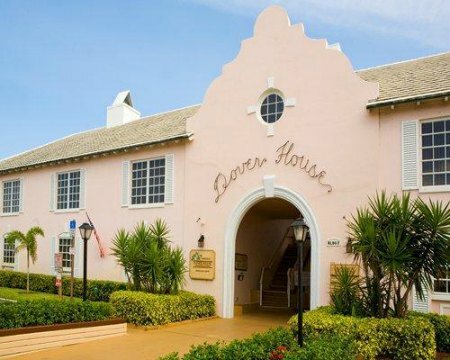 Continue walking south to The Dover House Resort, located at 110 South Ocean Boulevard reflectve of Revival Style architecture of the 1950’s. Soon, on the west side of the street is the Sandoway House Nature Center, built in 1936 and listed in the National Register of Historic Places. Sandoway offers unique educational experiences and is a wonderful place for the entire family. 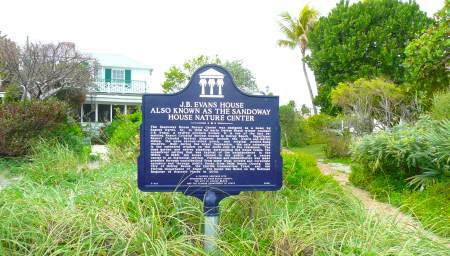 Below is the historic marker for Sandoway House proclaiming its historic facts. Note to my readers: Sandoway House Nature Center offers shark feedings six days a week. 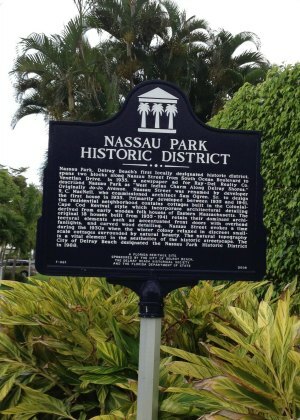 At the corner of Nassau Street and Ocean Boulevard begins the Nassau Park Historic District. 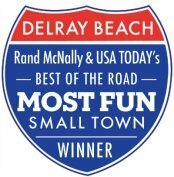 This two-block historic district in Delray Beach consists of eighteen one- and two-story Cape Cod Colonial Revival Style Cottages built in the 1930’s and 1940’s. This district is located at Nassau Street and extends to Venetian Drive Historic District. 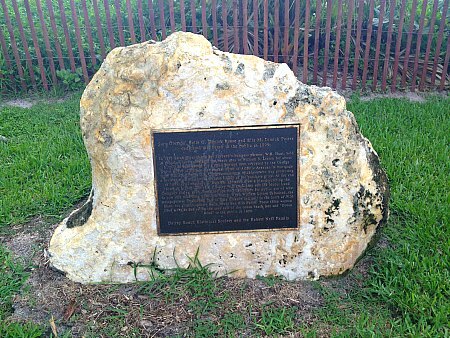 A historic marker has been placed on Nassau Street near the corner of Venetian Drive. Continue your beach walk beachside, east of the sidewalk at 200 Ocean Boulevard and Bay Street, is the most recently placed historical marker. 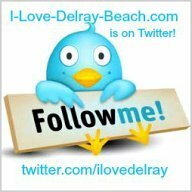 It commemorates the dedication of the Delray Beach Municipal Beach which was donated to the City of Delray by the Hunt and Gleason families in 1899. Sara Gleason held the title to the Delray Municipal Beach. At 340 South Ocean Blvd is Anchor Park so named for the ship’s anchor in front. Anchor Park is the home of the Ocean Rescue Division Headquarters. This park offers outdoor showers; a playground, picnic tables and a barbecue grill, making it an ideal place for a family outing. 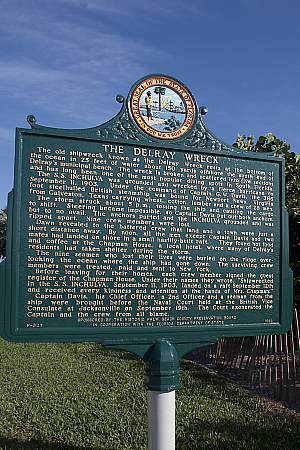 (Note: The S.S. Inchulva is aka as the "Delray wreck"). Wrecked by a fierce September 11, 1903 hurricane, the S.S. Inchulva in 5 broken sections is scattered at the south end of the Delray Beach Municipal Beach. This is considered one of the best diving spots in Florida and is located only 150 feet offshore and under 25 feet of water. 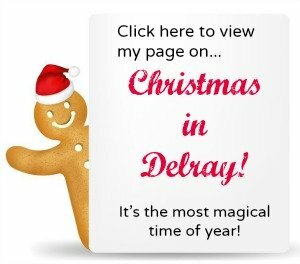 The mile-long Delray Municipal Beach ends at this point. 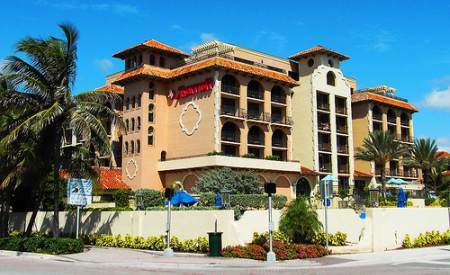 At the corner of Casuarina and (A1A) Ocean Boulevard, is the luxurious Seagate Hotel Beach Club. This private club offers its members dining, swimming and beach privileges just across the street from their elegantly appointed residences. Further south toward Linton Boulevard are mega mansions on beachfront property. This is a nice scenic drive if you don't want to walk this far. 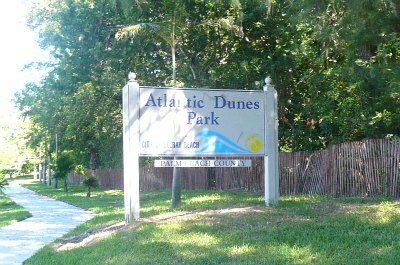 And just prior to Linton Boulevard is Atlantic Dunes Park -- which really is a beach -- not just a park. So, don't let the sign fool you! There is a beautiful beach at the end of the boardwalk! 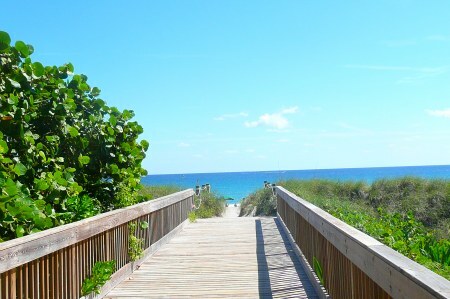 This nice boardwalk takes you directly to the beach! You can see the ocean in the very background. This is a very nice beach. There is plenty of paid-parking across the street from the park.